… and which I am not likely to get around to watching, at least not in the foreseeable future. Because today is the tenth birthday of my blog, and this is my way of wishing my blog a happy birthday. Ten years ago, when I launched Dustedoff (with this post), I had imagined it to mostly be a collection of reviews—Hindi and Hollywood films—and some song lists. Dustedoff evolved down the line. A cousin who commented on one of my earliest posts asked if I would review foreign language films, and when blog reader Bawa, visiting Delhi, she gifted me a DVD of a Spanish film, which became the first non-Hindi, non-English film I reviewed on this blog. Still later, a friend suggested I combine my website (which was all about my fiction writing—my books, articles, and short stories) with my blog, so that happened, expanding the scope of Dustedoff. What you see today is still primarily a blog about old cinema (the period of cinema I focus on is one thing that’s remained consistent), but it’s now also about travel and food and history and other things that interest me. Of all that I write about on this blog, the most popular posts—by a very, very great margin—are the ones that feature song lists. When I compiled my first song list, one restriction I imposed on myself (and how controversial that has turned out to be!) was that I would feature songs only from pre-70s films I’d already watched. People asked me why this was so; some urged me to rethink that decision; some thought I was dumb to limit myself so. But I took that decision (partly because there are some songs, I realize, that need to be understood in context, partly because it helps make compiling lists more challenging for me, and partly because it encourages me to watch more cinema, including obscure stuff). And that is a decision I’ve stayed with. But. Today is Dustedoff’s 10th birthday. A celebration is in order, I think. And my way of celebrating is to let my hair down a bit—with ten songs I really like but which I’m unlikely to ever get to post, because it’s equally unlikely that I’ll ever get to watch these films. In most cases, the films seem to have completely disappeared off the radar; I have spent years looking for them, both in DVD/VCD format, and on the Internet, but they seem to have vanished. Rare films, or lost films. Perhaps some of these will emerge someday and I’ll be able to watch them, but for now, that seems like a remote possibility. (Note: These are not songs that were originally part of a film but were later deleted—so CID’s Jaata kahaan hai deewaane, or Shikast’s Chaand madham hai don’t qualify, since I have seen the film in question; it was just that the song was missing). So here we go. As always, these are from pre-70s films. For once, not films I’ve seen. These songs are in no particular order. 1. Do dil dhadak rahe hain aur aawaaz ek hai (Insaaf, 1956): I don’t remember where I first heard Do dil dhadak rahe hain—it was probably on an old LP of my parents’—but I do remember falling in love with it instantly. Talat has long been a favourite of mine, and here, paired with Asha, he sings a beautifully romantic song of two lovers brought together: their hearts beating as one, their voices coming together on one note. I searched for Insaaf high and low, but to no avail: it doesn’t seem to be around, at least not on digital media. 2. Laal-laal gaal (Mr X, 1957): Search for Mr X on YouTube, and you’ll get either of two things: Laal-laal gaal, or Mr X in Bombay (and its many songs, which include the wonderful Mere mehboob qayamat hogi). The latter stars Kishore Kumar and Kumkum, with Kishore as a man who discovers a mantra that makes him invisible. I have no idea what Mr X—starring Kishore’s elder brother, Ashok Kumar—is about. What I do know is that it features this delightfully peppy number sung by Mohammad Rafi (and supposedly picturized on Johnny Walker, which sounds plausible: somehow, I can see Johnny Walker shaking a leg to a song like this this; Ashok Kumar I cannot envision as the singer of Laal-laal gaal). Such a fun song, and one that always makes me want to get up and dance. 3. Halke-halke chalo saanwre (Taangewaali, 1955): Ever since I’ve been blogging, I’ve made a conscious effort to try and watch (and review) as many Shammi Kapoor films as I can—and I’ve realized that few of his early films seem to be around (Miss Coca Cola and Coffee House, I’d been informed by Induna, were among the films that would be out soon on VCD or DVD, but this was several years back, and no sign of either yet). One Shammi Kapoor film I’m especially eager to watch is Taangewaali, and that as much for this fabulous song as for Shammi Kapoor. I can imagine what the picturization of this might be like: two lovers, going off in a tonga, singing a song… (Though, knowing how deceptive some songs can sound, that may well not be the case). Till then, I suppose, I will have to satisfy myself with just listening to the song. 4. 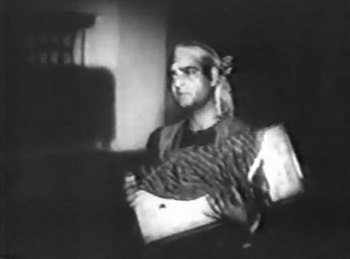 Baabul mora naihar chhooto re jaaye (Street Singer, 1938): The National Film Archives (and possibly Doordarshan) might have a copy of the 1938 Street Singer, starring KL Saigal and Kanan Devi. A reader on this blog certainly remembered having watched the film on television many years back. However, searching for it yields up only a 1966 Street Singer, not the 1938 one. And I do want to watch the 1938 film, if only for this song. KL Saigal’s rendition of Wajid Ali Shah’s poignant poem, referring to his exile from his beloved Awadh, here symbolized by a bride being taken away in her doli from her father’s home, is hauntingly beautiful. It is even more laudable considering that he sang as he walked along behind the moving vehicle in which the camera and crew were preceding him. 5. Ae gham-e-dil kya karoon (Thokar, 1953): Like Taangewaali, Thokar is another Shammi Kapoor film that seems to have vanished. In this, he starred with his earliest co-star, Shyama, and while I know nothing else about the film, I do love Ae gham-e-dil kya karoon. Talat might seem like an unusual (and possibly not very convincing) playback singer for Shammi, but one must remember, of course, that Shammi of the pre-Tumsa Nahin Dekha days was often slotted as a lovelorn hero, not the madcap romantic hero of his stardom. For such a one, the soulful voice of Talat perhaps fitted well—and what a beautiful song this is. 6. Jaa re badra bairi jaa (Bahaana, 1960): Madan Mohan, the composer almost everyone associates predominantly with ghazals, was far more versatile than that—and in Jaa re badraa bairi jaa he displays his talent with a lilting, lovely song with a definite flavour of the classical in it. The instrumentation is subdued enough to let Lata Mangeshkar’s voice shine through, and she uses that opportunity to the hilt, creating a song that’s rippling and melodious and somehow very evocative of the falling rain, the softly blowing breeze of the monsoon. 7. 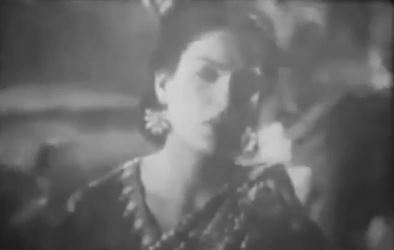 Le chala jidhar yeh dil nikal pade (Miss Bombay, 1957): I first came across this cheery road song years ago, when I encountered it on Chitrahaar. Back then, my sister and I always used to keep a partially blank VHS tape ready for recording in our VCR when Chitrahaar came on, just in case we came across a song we liked, and that was how Le chala jidhar yeh dil nikal pade came to be recorded on one of our tapes. I watched it many times over the following years, and I’ve never tired of it. It’s got a good tune, Rafi’s sung it well, and the details—the little mannequin with a violin, tucked away in a niche somewhere on the outside of Ajit’s lorry—are charming. Plus, this is from an era when Ajit was still pretty eye-catching, so that’s enough reason for me to want to watch the film. 8. Mera sundar sapna beet gaya (Do Bhai, 1947): One of my earliest childhood memories related to Hindi cinema is of listening to my parents’ collection of Hindi film music—and that too, the LP of The Best of Geeta Dutt. That was where I first heard Mera sundar sapna beet gaya, and (considering I didn’t begin to acquire a liking for pre-50s Hindi songs till many years later), I loved this one even then. 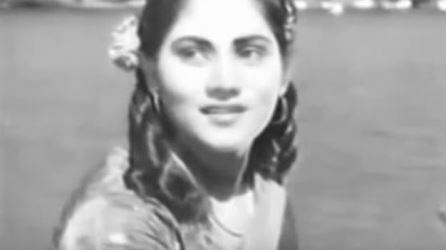 Geeta puts her soul into it, and SD Burman’s music plus Raja Mehdi Ali Khan’s lyrics make this an unforgettable song—it’s poignant, it’s bitter, and it is sadly also so true of what happened to Geeta Roy later in life. 9. Mere khwaabon mein khayaalon mein chhupe (Honeymoon, 1960): Vintage Salil Choudhary, this song is one that the composer set to words both in Hindi and Bengali versions (click on the link from the name of this song, and you’ll get to a URL that includes both Bengali and Hindi versions). I will admit that the Bengali version—sung by the honey-voiced Hemant—is my preference, because it is just so mellow and beautiful, but the Hindi version, sung by Mukesh and Lata, comes a very close second. 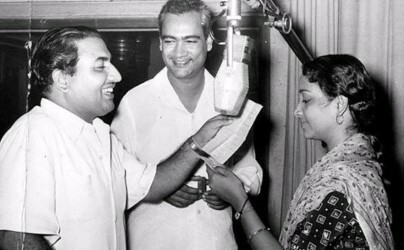 While I prefer Hemant’s voice to Mukesh, the fact that Lata’s voice is brought in to lend that lovely wordless singing in Mere khwaabon mein khayaalon makes it that bit better as a bridge between the verses. A wonderful song on many counts. 10. Lehron pe lehar (Chhabili, 1960): Although the tune of this song is an obvious lift, it’s still a lovely song. The gorgeous voice of Hemant begins tand carries most of it through, in what sounds like a really romantic setting—I can almost imagine the beach, the sea beyond, the moonlight and the stars. Joining Hemant in this song is none other than Chhabili’s heroine, Nutan, who I think does acquit herself pretty well as a singer. The song from which this music was copied, by the way, is The man who plays the mandolino, sung by Dean Martin. That’s it, then. Are there any other great songs you can suggest from films that are pretty much impossible to get hold of, at least online? On your 10th Anniversary, would be nice to know how you finally decided on this name. Simply a case of ‘dusting off’ old films and bringing them to light again. A big congratulations on your tenth anniversary and wishing you carry on forever. It is quite a task to continue a blog for so long with interesting posts regularly. This ategory would not apply in my case and, I guess, in case of other bloggers, too, who write on old film songs, because I have not put any such restrictions on myself. The reason is simple – my movie watching has been minimal, but absorbing songs through radio and other sources has been substantial. Plus the fact that many old/vintage films are not available, means that less than 5% of the songs appearing on my blog would be from films I have seen. Back from the digression, yours is one of the blogs I follow for interesting material and good quality writing. Congratulations and best wishes again. I suppose if I had followed in my father’s footsteps completely, I would have devoted myself only to Hindi film music, too – my father is so fond of Hindi film music of the 50s in particular that he would recommend films as ‘good’ only on the basis of the music. My sister and I realized very early on that his recommendation didn’t mean that the film itself was necessarily good. But I suppose somewhere down the line I fell deeply in love with films themselves, and became intrigued by them – so yes, they do remain my focus. I also haven’t seen any of those ten films! Happy 10th Birthday to Dustedoff! I’ll never forget this date, as it is my daughter’s birthday as well. We celebrated her 5th birthday today. And what a great song list. I too obviously like all of the songs. I thing about Mr X, I think it was about a man to has ability to go invisible, as in Mr India. A funny thing about the film, I read in a Marathi book by Isaq Mujawar. It is said that, the producer of the film was known for non paying the actors on time or not at all. So Ashok Kumar asked him for payment on per day basis. But the producer was so wise, that he got Ashok Kumar’s close ups recorded in a few days and paid him. But didn’t call him for a long time. It is said that, the producer completed the films by long shots with a dummy. And for a long part of the film, Ashok Kumar was in invisible mode, so he didn’t call him at all. Such a funny thing! 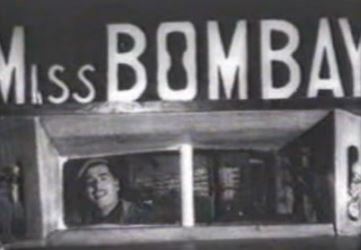 The song from Miss Bombay. Honeymoon, and Chhabili are also my absolute favourites. I again wish you and the blog, happy anniversary and may you continue the blog forever! It’s really so difficult to continue the Hindi cinema blog for such a duration. I know it is! Wishing your daughter A Very Happy birthday and many happy returns of the day with lots of prosperity, happiness, health, wealth, wisdom, success, joy, cheers, loving, safe and peaceful long life. All Goddesses and Gods shower their blessings on her taking care of her coupled with mine. Thanks a lot for your wishes Uma ji. I’m overwhelmed with your wishes and blessings. And, a very very happy birthday to your little girl. I pray for many blessings and much joy for her. Anyway, let me add one of the most beautiful songs of any genre! It’s from a 1960 film called “Girl Friend”. The only film that starred both Kishore Kumar and Waheeda Rehman (another one with this jodi, “Professor”, a Guru Dutt production, never saw the light of day until many years later writer Abrar Alvi and director Lekh Tandoon revived it, featuring Shammi Kapoor and a rather uncharismatic actress Kalpana). Manuela, thank you so much! And for Kashti ka khamosh safar. I love this song and am wishing I’d remembered it – this fits this theme so beautifully. Congratulations Madhu and your dedication inspires me to start my blog one day. Lets see! Thank you! And, I do hope to see you begin blogging some day. :-) Good luck! Congratulations on your tenth anniversary! I like your idea of songs from films not watched! For this is how it has been with me all along! Lover of Hindi movie songs from a non-Hindi speaking area, it was easier to hear than to see! And it became a habit! Addict of Radio Ceylon from 57 to 64 or so, listening to Hindi film songs for 5 to 6 hours a day ( including Hindi songs in their Sinhalese broadcast), it became rather unbearable to watch the movies, as the image on the screen fell far short of the imagination fed by the music earlier! Later in Delhi, I had a chance to watch the movies,but didn’t like the experience. The songs are not always picturised well, the songs do not always go well on some actors, and the visuals somehow detract from the beauty and depth of the lyrics in many cases. So I have confined myself to listening to the songs, with the lyrics to read by the side! So I enjoy the music, without associating any actor/actress with it. This has its down side, as the songs on discs may not contain all the stanzas in the movie! This happens even now with some CDs. I just put up with it. I have not seen movies for the last 43 or so years. I confine to the 50-70 song width. I believe 50s were really the golden years. But some of those old dance/club songs are gorgeous without being vulgar in the least. They are indeed a visual treat even now. This is a unique way of listing lost films Madhu. Happy blog anniversary. You put in so much effort into it and are rarely lazy. You deserve every bit of success you have achieved. May you reach many milestones. Hugs. Thank you so much, Ava. :-) Hugs back! How about Afsar? Wasn’t that movie lost as well? It had some lovely songs. Yes. Afsar, Coffee House and Miss Coca-Cola had several songs between them which made it to my shortlist, but then these were the ones that made the final cut. Talking of Afsar – that’s one film I’d really love to have been able to watch. It sounds delightful. Let the 11th year bring more nd more innovative , wonderful , melodious posts for us . though as a reader , I am proud of being a part of this blog. I really think you should leave out that ‘though’ – because readers are an essential part of a blog! Without the engagement with readers, a piece of writing cannot achieve what it sets out to do. So, thank you for the wishes, but even a bigger thank you for reading my blog, Pramodji! You gladden my heart with your words. Thank you so much. I am so touched that my blog can have kept you company during your travels, and that you should refer to my reviews. Thanks. Have a great run ! Happy Blog anniversary and congratulations on a milestone achievement! This post is very representative of your blog, Madhu – entertaining, informative, and accessible. You have a knack for writing posts that offer food(sometimes literally :-D) for thought and invite participation. Love reading your blog and hope to continue doing so for as long as you care to write. You are too kind, Shalini! Thank you so much for those lovely words – that’s so encouraging. Jhuka-jhukaake nigaahein milaaye jaate hain is a good song. It had been on my shortlist, but got pushed to the back by other songs that I liked more. Happy to see you adding it here in the comments! Thanks for that. An on the post.. a favourite is this Salil Choudhary gem in Manna Day and Late M’s voice from a Base Bhattacharya unreleased (as far as I know) 70’s film Sangat..
Oh, nice. Initially, I thought I had heard this before, but now I’m not so sure. Such a quiet, beautiful song. Both these songs I was familiar with, but both, too, I never realized were from films that never got released. Thanks! Happy Tenniversary Dustedoff! Well done! I know it’s a huge accomplishment because there is incredible amount of energy and passion behind each of your post. And doing this for 10 years shows the commitment you have made, which in turn makes it such a pleasure to come here and read about things that I love to learn more about. Keep it up and best wishes to many more tenniversaries to come! Thank you so much, Ashish. :-) Those are very kind words! – and very encouraging. I’d forgotten that she’d written about it. It’s an old, old favourite of mine, as I’ve mentioned in my post. I love that post so much that I can’t stop reading it, and I wanted to do my own Rafi alphabet. Do, do! :-) And let me know when you do – would really like to read. I tried to, I wanted to, but it was a difficult decision for me to pick just one song per letter, so I decided to list down as many songs as I could think per letter. So I ended up creating those playlists. Happy, happy birthday to your blog, Madhu! What a lovely milestone and what a nice way to celebrate it. I’ve heard all these songs and haven’t watched any of the films mentioned, except Do Bhai and Honeymoon. It’s a pity the film was never released. Balma more aanchra is a lovely song – I don’t think I’ve heard this one before. It looks like a film I’d liked to have watched. Sangat does look like a film I would have liked to have watched as well. I really don’t know why it didn’t release. Like Madan Mohan who seems to have composed music for films which sank without a trace, Salilda seemed to have been cursed to compose music for films which never saw light of day. Here’s another Malayalam song from a film called Devadasi – of course, the film was never released. The songs are fabulous. Such a shame that these films never got released. Oru naal vishannere sounded lovely. Congratulations on the 10th anniversary of your blog! I hope you keep the song lists flowing. I too love so many old Hindi songs from movies that I haven’t watched, and am not likely to ever watch. The obvious reasons are (a) The movie is not available, either on DVD/VCP on or YouTube, and (b) Even if it’s available, the print is so bad that it makes for painful watching (a sad commentary on the state of film preservation in India). But more importantly, I’ve come to the conclusion that in the 50s and 60s, the quality of music outstripped the inherent quality of the films themselves and therefore many films with good music are not really worth watching, particularly if they have just one or two good songs. This is based on my experience of being disappointed watching movies that had great songs but were otherwise quite poorly made and uninspiring – Jaali Note, Uran Khatola, Mujrim and 12 O’clock, to name just a few. Thank you so much for the greetings, and even more so for the songs you posted! Lovely ones – I had heard Bada hi CID hai and (I think) Sun mere saajna re, but the rest were all new to me. I agree with you about a lot of great music from the 50s and 60s being wasted on movies which weren’t even good. I have lost count of the number of films I’ve watched simply because it had songs which I liked, only to find that the film itself was – in far too many cases – painful to sit through. Actually, come to think of it, there were several films (Barsaat ki Raat is a fine example of this) that had such fabulous music, you tend to forget that the film itself isn’t all that great – it’s just that the songs are so brilliant, they mask the relative average-ness of the film. Madhu, dodgy theme, we can only comment on your choice but cannot add anything. Great theme Madhu. I tend to watch movies which have great songs as well – disappointed a few times. As a kid we were not allowed to watch movies except after ‘finals’ so movies had a greater fascination for me. Recently someone sent me this link to a song from the film Jhoola 1941 – a song that Kishore used in Padosan many years later – Perhaps a movie I may want to see, if I can find it. Thank you, Nishi. Glad you liked this! I’ve heard of Jhoola, and I’ve come across this version of Ek chatur naar too; good song. Speaking of Ashok Kumar singing a song which was later sung in a more popular version by Kishore, here’s Koi humdum na raha from Jeevan Naiyya (1936), a film which also seems to have vanished. Yes, I know about this version of Insaaf. A friend has watched this and confirms that it doesn’t contain Do dil dhadak rahe hain. This one, despite the label, is the 1966 Insaaf, not the 1956 one (which starred Nalini Jaywant). Yes. Gul Sanobar is on my list to watch – it’s even available on Youtube as well. No songs from this on my list, though. Happy tenth anniversary, Madhu! I wondered how long it had been, exactly, since we first started visiting each other’s blogs, and so I checked the history of comments that you had made on my blog, and I see them going back to July 2009. Though I am sure I was looking at your blog (and maybe vice versa) a bit before that. It may be that I’ve been stopping here since the beginning – and if not quite then, as you see, close enough! My blog is now a little over 11 years and three months old, but it’s gone through a few major shifts during that time, and how I have strayed! Dustedoff may have evolved in the sense that you decided to expand to films that are in languages other than Hindi or English, and you did merge your sites, too, but this blog has been remarkably consistent in terms of providing good, solid write-ups of films on a regular basis, in addition to giving us so many interesting song lists. And now you seem to be posting more than you ever did! It is quite an accomplishment to keep going this way for ten years (and counting). By the way, it was nice to see your preface describing the evolution of your blog over the past decade, but unlike some of us, you didn’t dwell on the subject for too long. :) You launched right into this new post in which you did something different, which was to post ten songs from films that you have never seen (and probably never will see). But as other people have pointed out already, your exception is the norm for most of us. The most impressive thing you revealed here is that you have actually seen all the films that contained all the many songs that you’ve posted about before. And that is just another reason that this blog is remarkable! I hope that it will keep going like this for quite a few more years. Richard, thank you so much for your comment and for the appreciation! Coming from someone who writes as well and with as much passion as you do, that it high praise indeed. Thank you, Madhu, for your very kind words (once again). You’re right that my post about Balraj Sahni’s autobiography preceded our first exchange of comments; that was on May 30, 2009. Hello Madhuji. Congratulations for completing ten years of your blog. I have been a silent follower of your blog for quite some time and have commented only twice. But I really appreciate the hard work that you put in writing each post. Kudos!! I found a weird video of the Taangewaali song. Pasting the link here. The picturization and lip sync are out of sync. But with the visuals, it’s very clear how incongruous Hemant Kumar’s playback sounds for Shammi Kapur. Thank you so much for visiting my blog, even if silently. And for the wishes! Oh! Is that so? Thanks for clarifying..
Yup. A lot of people seem to use this technique to make songs for which a video either does not exist or is not readily available, more interesting to watch. Heartiest Congratulations. 10 years is really commendable. Keep writing. All the best. Congratulations for the completion of the maiden decade . Most of the songs that I listened in the radio days, or purchase of vinyl record /casttes days belonged to the films that I had not seen. That hold true for even most of teh video clips I see / listen from net today. In fact, in the case of pre-1970 films, seeing a film for the song(s) that one liked was a great disappointment. In fact, that is why I find your (and That of Anuji) reviews, too, be a great luxury where you vicariously enjoy the films without having to go through the torture of sitting through the whole film. I join in the expectant readers of the blog Dusted Off for enjoying a varied fare of differently viewed Hindi films and the song lists. Thank you so very much for your wishes, Ashokji. It is the support of friends and readers like you that keeps me going. Oh, yes. Nayee manzil nayee raahein is a wonderful song. Long time since I heard this one! Thank you for it.